The Doctor has regenerated, and things are not going well (regenerations never ever go well, do they?). Given that, this is absolutely the WORST time to have Earth invaded. Think what it will do the Winter Solstice sales? The Christmas Invasion is the debut story for David Tennant, and thus we do begin a new era for Doctor Who. I can't say that it is particularly memorable, but it isn't awful either. Before we get to the actual story, we have a mini-episode tying in Bad Wolf Parts 1 & 2 and The Christmas Invasion. It was a segment on the Children In Need special. Here, the Doctor (Tennant) has just regenerated to a shocked Companion Rose Tyler (Billie Piper). He is at first thrilled at his new appearance and oblivious to how Rose would take it. She doesn't believe the Doctor is the Doctor at first, but he soon convinces her. Rather than take her to the planet Barcelona, he's taking her to the Powell Estates, her home, for Christmas. However, his regeneration comes with complications. Now we get to the story proper. The Doctor is coming in and out of consciousness as we crash into London. The sudden arrival of Rose thrills her mother Jackie (Camille Coduri) and her erstwhile boyfriend Mickey Smith (Noel Clarke). With nowhere else to go, he is forced to recover in the Tyler's flat. We find that Harriet Jones (Penelope Wilton), formerly a backbencher MP in Aliens of London Parts 1 & 2, is now Prime Minister (as the Doctor said she'd be). She is excited to be launching the space probe Guinevere One, which quickly gets sucked into a large asteroid. Or is it? Rose tries to get into the Winter Solstice Spirit, but a group of Santa Clauses (Santa Cli?) come upon them, and rather than spread Christmas cheer, they spread bullets. Even worse, the Tyler Christmas Tree goes mad and attacks them. Yes, you read right, all the while playing Jingle Bells in a hyper speed manner. The Doctor comes around just in time to save them, and now he suspects an alien force at work. With that, he slips back into unconsciousness. On this Winter Solstice Day, all of Britain is excited by the newest images coming from Guinevere One, but Daniel Llewellyn (Daniel Evans), the Guinevere Project Manager, seems highly nervous about the momentary loss of contact at the press conference. We now interrupt our regularly scheduled Mars landing with a special bulletin: aliens are broadcasting threats against us, and on Christmas Day no less. Panic at the highest levels creates a mad rush to the Tower of London, where an emergency meeting of UNIT (formerly the United Nations International Taskforce, now the UNified International Taskforce) is taking place. Prime Minister Jones, along with her right-hand man Alex (Adam Garcia), are keeping the true nature of the alien threat secret. There's an alien ship a'comin'. They don't look too friendly. Major Blake (Chu Omambala) of UNIT is highly reluctant to get Torchwood involved in all this. Wait, what's this? What's Torchwood (besides an anagram of Doctor Who)? That's not too important right now. Bigger fish to fry and all. We now learn the alien's plan: the Sycorax now demand the Earth's surrender. Of course, the reply is a no. When learning that, the Sycorax release something that makes a third of the world's population start walking almost as in a trace where they head on up to the highest building they can find and going right up to the edge. The common thread: all affected are A positive blood type. With no way to stop it, Prime Minister Jones is forced to go on television to address the world, and plea for the Doctor to contact them. No time to wait: the Sycorax spaceship comes to London. Major Blake, Llewellyn, Adam, and the PM are transported to the alien ship while the Tylers and Mickey head to the TARDIS with a still-out Doctor. The terms are presented: surrender or the humans will be made to jump, and when they do surrender, half the world will be sold into slavery. The Sycorax discover the TARDIS, and take it aboard as well, along with Rose and Mickey. Tea that Mickey accidentally drops does what nothing in the universe could do: revive the Doctor. A typically British response to all emergencies: put the kettle on. The Doctor and the Sycorax agree to a duel for the planet. At one point the Sycorax Leader (Sean Gilder) literally unhands the Doctor, but lucky for us: it's still within 15 hours of his regeneration, so he is able to grow another. The Doctor defeats him and spares him in exchange for leaving the planet forever. We could have had a happy ending, but alas, we couldn't leave it alone now, could we? Once the Sycorax ship departs, Prime Minister Jones orders it destroyed via Torchwood. This infuriates the Doctor, and he takes his revenge with six words: "Don't you think she looks tired? ", thus bringing down the Thatcher...I mean Jones...government. Still, it IS Christmas, which means a party and a new wardrobe for the Doctor. This Christmas brings what we first think is snow, but it really is ash from the destroyed spaceship. The Doctor will continue to travel, and Rose will continue to go with him, and Jackie and Mickey still disapprove. All things being equal, nothing changes. Russell T Davies' script has to have those little winks to the audience he so loves in The Christmas Invasion. For example, when Jackie sees the Ninth Doctor for the first time, she asks, "The Doctor. Doctor Who?" (Curiously, this is the First Question the Silence knows must not be asked, but surprisingly enough, it doesn't appear to bother them here. Curious, that...). A bit later, when told he has two hearts, Jackie asks, "Anything else he has two of? ", a remarkably risque question for a children's program, or at least one that is meant to be family-oriented. Even more bizarre is the Doctor's declaration that he wanted to be 'ginger' and disappointment that he wasn't. While he meant it to mean that he have reddish hair, ginger could in British slang also mean 'homosexual'. I mention this because Davies is openly gay, but in terms of his writing it is a curiosity that he is equally open about using terms that could be misconstrued. In Aliens of London Part 1 Rose mocked the Doctor by saying that he was "so gay", and now we have the Doctor possibly wishing he were a homosexual. I don't know what Davies' intentions were: whether it was a conscious decision to cast the Doctor as gay or just an innocent coincidence. I condemned him for using 'gay' as a pejorative in Aliens of London, but in this case, I'm going to disagree with those who are probably making too much of the term 'ginger'. I imagine that Davies doesn't expect us to take this seriously, not with lines like, "I'm going to be killed by a Christmas Tree" being bandied about. It also doesn't help to see Prime Minister Jones continue her schtick of flashing her identity card and introducing herself as "Harriet Jones, Prime Minister". The usual response from everyone is a variation of "I know who you are". Even the Sycorax leader says that. Those little bits of comedy wear thin fast. We're suppose to take our Prime Ministers more seriously than that, and given how often she does this we stop thinking it's funny very quickly. The biggest issue in The Christmas Invasion is the surrounding of a cloak of mythology over Torchwood. Is it a new superweapon? Is it a special organization meant to cover extraterrestrial issues sans Doctor? Is it a potential Doctor Who spin-off that will take on a life and hard-core fanbase of its own to where its origins in Doctor Who are almost forgotten? Is it all three and so much more? I digress to say that not being a Torchwood fan or even ever having an interest in watching Torchwood, having it mentioned in The Christmas Invasion doesn't make me giddy with excitement. In fact, that may be why The Christmas Invasion is neither a great Doctor Who episode or a lousy Doctor Who episode. 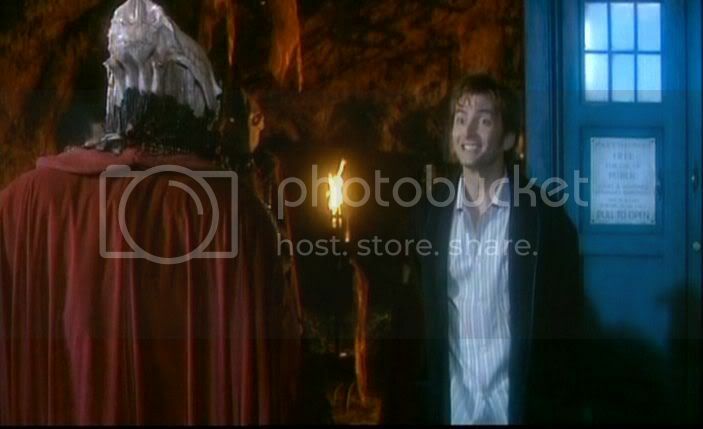 The Christmas Invasion is suppose to be less menacing and dark because it is suppose to be something for the holiday. This might explain why the Sycorax are not a particularly menacing threat or why we need certain Deus Ex Machinas (the regrowing hand, the Doctor reviving just in time to stop the killer Christmas Tree) to get out of situations. James Hawes to his credit kept things flowing both quickly and easily, moving from the action in the Tyler flat to the Tower and the Sycorax ship without it appearing forced or jumping without rhyme or reason. He also drew great performances from his cast. Chief among them is Tennant as the Tenth Doctor (Ten-nant, Tenth, wonder if there's a connection...). He plays the Doctor with full authority, his Doctor being a man who can be both forceful and jolly in equal measure. Piper continues to improve on her Rose (although when she thinks the Doctor is dead, her crying jags made me chuckle slightly more than feel sadness). It is nice to see Coduri more tender towards the Doctor than she has been before (even if it was only brief) and equally nice to see Clarke's Mickey be less of an idiot (although he still is frustrated at having to play second fiddle to the Doctor). Wilton is a great actress (Downton Abbey and The Best Exotic Marigold Hotel showing us thus), and I'd forgotten that she was even in Doctor Who. I don't know if we HAD to have Harriet Jones back. It brings back memories of the early years of Doctor Who when they tried to establish certain characters that would appear again and again. Would it have worked any better if a new PM had come? I think so. I also do note the work of Omambala as the strict UNIT Major and Garcia as the efficient aide Alex, bringing a seriousness and even humor in the story. As I see it, The Christmas Invasion doesn't have a lightness that a Christmas episode would lend itself to, nor is it a dark story that will be too frightening. However, I don't think it's particularly brilliant or memorable nor is it atrocious. It's just OK, a bit like Christmas treats: not bad but not long-lasting.